We’ve covered all manner of biologically inspired robots over the years. Turns out nature has had a bit of a jump on us in the engineering department. So, why not steal a few designs? The latest we found is as maneuverable as it is mesmerizing. The ETH Zurich robot, Sepios, takes its cues from the cuttlefish, a cephalopod (think squid) with two undulating fins. Unlike our naturally occurring cuttlefish friends, however, the cuttlefish bot consists of four fins in x-wing configuration. 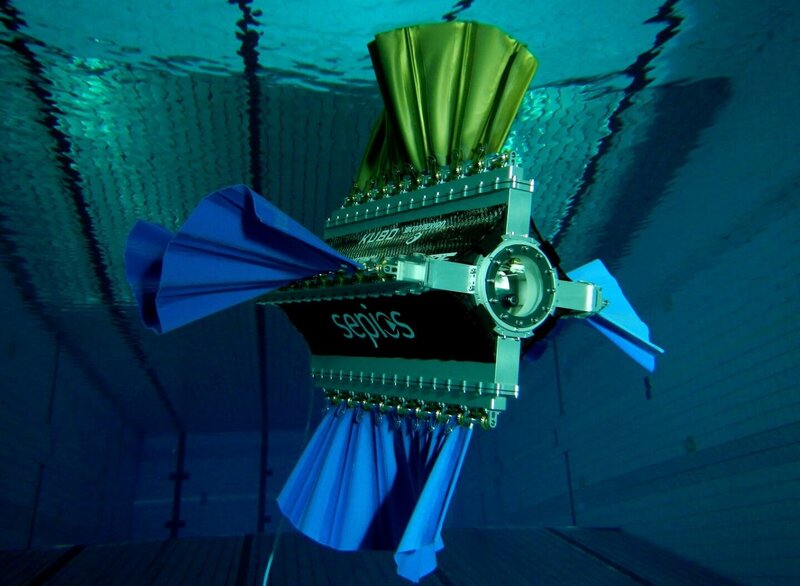 Each fin is controlled by nine independently motor-driven pins (36 total) and another motor in the body runs a swim bladder to control the bot’s depth on dives. These can last up to 90 minutes on a single charge. Sepios is very maneuverable—able to travel in any direction and around any axis—but with a max speed of a little over a mile per hour, it isn’t terribly fast. And at a dive depth of 30 feet, it won’t be surveying the Titanic any time soon. There are a growing family of ocean-going robots. Some are self-propelling, like Liquid Robotics’ Wave Glider, for long autonomous data gathering expeditions on the surface, and others, like these autonomous Argo robotic floats, dive deep for data. Relying on a battery to power its servos and sensors and a human operator, however, Sepios is more likely a useful design for animal observation. Free of propellors, it can silently navigate shallow seas replete with dense patches of seagrass (as we see in the video). Stirring up little excess current or noise, and equipped with a camera, the bot is unlikely to greatly disturb marine animals—though one potential weakness might be overlong observation of particularly toothy and aggressive (or curious) critters. Whatever its future, however, Sepios is another cool example of robots imitating nature. The best part? It’s a pretty big, weird world—so we aren’t likely to run out of inspiration any time soon.